Enjoy 25% off all dressed-up styles at J.Crew today and tomorrow! It’s perfect timing considering all of the weddings coming up this spring. I’m taking home this pretty pleated skirt and this fabulous necklace. This scalloped dress is a great choice for a bridal luncheon or engagement party! Click here to shop the discounted items and enter code SPRINGISHERE at checkout. As if I didn’t like Anthropologie enough, they’re offering 15% off dinnerware for a short time only. Stock up on cute pieces like these pastel color-blog mugs, super useful and adorable bowls, or these colorful printed side plates. Click here to shop the selection – no code needed at checkout! Some pieces from the Missoni x V+A (Victoria & Albert Museum) jewelry collaboration made their debut on NET-A-PORTER on Friday and I’m dying to own some of them! The collection is exclusive to the luxury e-tailer and is in celebration of the museum’s The Glamour of Italian Fashion 1945-2014 exhibit. My favorites? This double-strand woven necklace, these bracelets, and this black & white collar. They’re all such wonderful pieces for summer with the woven Missoni fabric, don’t you think? PS – 10% of every purchase from this collection on NET-A-PORTER will be donated to the V+A Museum. That Saint-Laurent bag is everything, great picks today! 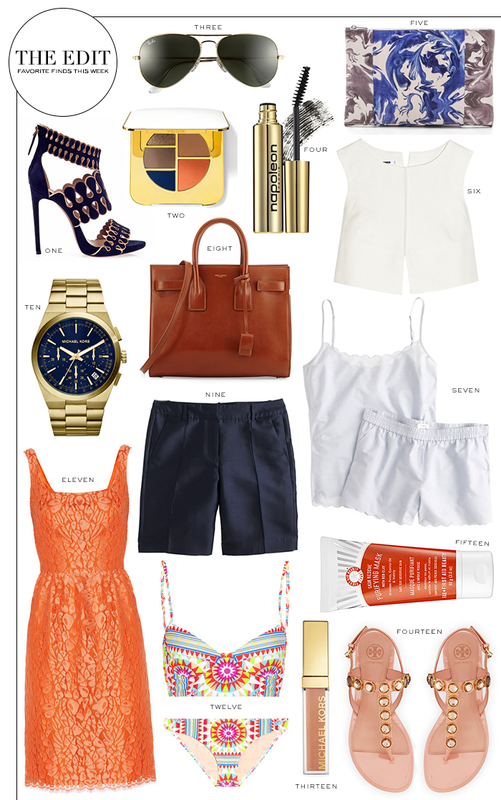 Nice picks, especially that Mara Hoffman bathing suit! That Issa dress is stunninggg. So perfect for a Spring/Summer wedding. Those navy J. Crew shorts are too good – just added them to my wish list! That bikini and those shoes are freaking adorable! Dreaming of a Saint Laurent handbag….sigh. I want the Sac du Jour sooo badly!! At Lucky Fabb they had a tan one as a giveaway- sadly I didn’t win it! I would love to have everything on today’s edit! Girl! You’re making me break the bank here! I love everything! I absolutely love that Saint Laurent tote! Perfection!! Obsessed with the printed swimwear and the Tory sandals! Love that pouch!!! As always stunning picks Merritt! 1, 5, and 11 please! Haha! Ekkkk that Saint Laurent. I am between that and the Prada Saffiano – both are so dreamy. But the black Saint Laurent looked so good on my arm at Barney’s in LA… might have to pull the trigger! Mara Hoffman definitely knows how to get me to want her items. Amazing colors! Love 5, 6, 7, 9 & 14. Great picks! That orange dress is just so pretty! I love these product roundups! I love love love those tear drop suede sandals. I think my husband would have a nutty if I bought them…It is times like this we wish we had a little secret stash of cash:) JK! Love it! What do I not love? I think that MK watch is amazing, the YSL bag is great, Classic Ray-Ban’s and I am obsessed with everything Mara Hoffman touches! I thought the clutch had a marble effect, but when I clicked the link, it said tie dye. Either way, I love!